I enjoyed the flavor and character of this read very, very much – but in the end, I was a bit underwhelmed by the plot. But first and foremost, it’s the characters that make this book – and at the heart of the matter lay the equally damaged and taciturn Blackthorn and Grim. And for these two alone, this book is more than worth the read, for theirs is a beautiful and unexpected partnership. The dance of their co-dependency, as they become the one constant in the wreckage of each other’s lives, was just breathtakingly lovely – even as they rub each other raw. Blackthorn is prickly as a hedgehog; sharp as broken glass – and the last thing on earth she wants is to be stuck with a hulking near-mute of a sidekick, a broken wreck. And yet, somehow, there is no denying their need for each other – like two veterans home from war, no one else can possibly understand them, or what they’ve been through – and so these two are separate from the world around them; alone together, even when surrounded by a crowd. But as their begrudging alliance slowly grows into a genuine friendship – but no further, as both are far too damaged for anything remotely resembling romance (thought there is perhaps a glimmer of hope in that direction towards the end) – it becomes more and more clear that these are two people made up of broken pieces, who can only stitch a whole together. And that, that is just brilliant storytelling. Truly, these two make this story special. But while the main characters are downright genius, on the plot side this book turns out to be rather thin. I don’t want to give too much away, but as you can tell from the cover copy, this entire story revolves around discovering the cause of Flidais’ strange behavior – which turns out to be something both ridiculous easy to discern (for the reader, that is – it takes a painfully long time for the characters themselves to figure it out, so yes, you will be far, far ahead of them), and worse, when the answer is finally revealed, it’s basically a huge plot contrivance that comes out of left field, a McGuffin with literally no larger plot significance whatsoever. So basically, it all boils down to hand-waving, a magical excuse that exists solely so a hapless damsel can be in need of rescue – and while yes, I do understand that this story takes place in a world of fey and magic and otherworldly happenings, it still, to my mind, wasn’t enough to justify the egregious nature of this particular magical contrivance. And so, I couldn’t help but unleash an epic eye-roll to accompany that final reveal. It was all just so…unsatisfying. The other part of this story I was less than taken with is the third main character, who also shares the narration – Oran, aka the Prince, aka He Who Is Clearly Destined to be The Important One. Now, generally speaking, I have nothing in particular against Oran – he’s nice, smart and sensitive, and all that – but it’s just, compared to Blackthorn and Grim, he comes across as a clear second best. To be honest, he’s just kind of…boring. Your standard romantic lead, in plain vanilla packaging – a pleasant enough fellow, but colorless – and so his romantic intrigues failed to captivate me. Sure, the goings on served adequately as mild entertainment, but when Oran was around I always was just kind of waiting, with varying degrees of patience, for the story to get back to Blackthorn and Grim. And the fact that I don’t particularly care all that much about him seems like it might be a drag on this series going forward, as clearly Oran is slated to become The Future King aka He Who Will Save Them All. Well, I guess we just have to hope he gets more interesting further on down the line. But as I’ve said before, I’ll say again – Blackthorn and Grim truly are the heart and soul of this book, and they are more than worth the read. Plus, I also really enjoy Marillier’s style of writing; how she envelopes the reader with her story. The particular world where this story takes place may not be highly colored or detailed, but it is wonderfully transportive in a way that has everything to do with Marillier’s particular cadence, and it easily and comfortably sucked me in. So in the end, I enjoyed this book – I just wasn’t entirely satisfied by it. But for Blackthorn and Grim alone, I will definitely be back for more. 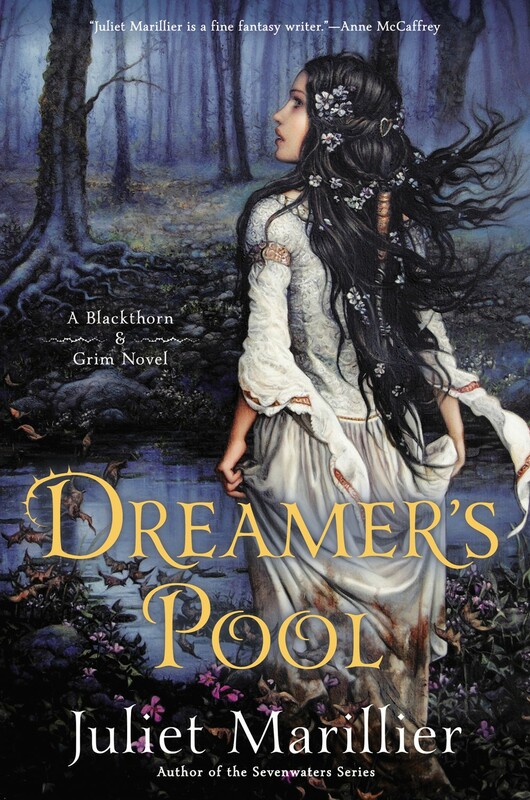 In Dreamer’s Pool, the first in her Blackthorn and Grim series, Marillier does some really wonderful character work, in every one of the three first-person perspectives she works with, and gives her protagonists tragic histories that actually affect them, which shouldn’t be such a rarity. She also writes perceptively and movingly about issues of justice and leadership, while still giving us a gripping plot and characters who are easy to love. Marillier’s fascinating narrative, based loosely on Irish myth and centered on women’s empowerment, never slips into sentimentality or untoward sensuality, delivering a tasteful feast for the imagination.